Mellanox has integrated the hardware needed to frontend an NVMe-over-Fabrics flash array into a single System-on-Chip (SoC) device, making it easier for shared flash storage system builders to put together NVMe JBOFs. A JBOF is, like a JBOD, just a bunch of flash drives – NVMe SSDs in this case. For them to be usable by apps in accessing servers across an NVMe fabric (NVMeF) requires the JBOF to have an NVMe-over-Fabrics frontend system. Broadly speaking that means a CPU plus code, rNICS (RDMA Network Interface Cards) to interface to the RDMA InfiniBand, RoCE (RDMA over Converged Ethernet) or other links to the servers, some DRAM and cache, and a PCIe switch to link to the NVMe drives in the JBOF. Mellanox has integrated the components for InfiniBand and RoCE server links onto its BlueField SoC. It says it has a fast mesh internal fabric and NVMeF data traffic can go directly from SSD to NIC (or NIC to SSD) without interrupting the CPU. 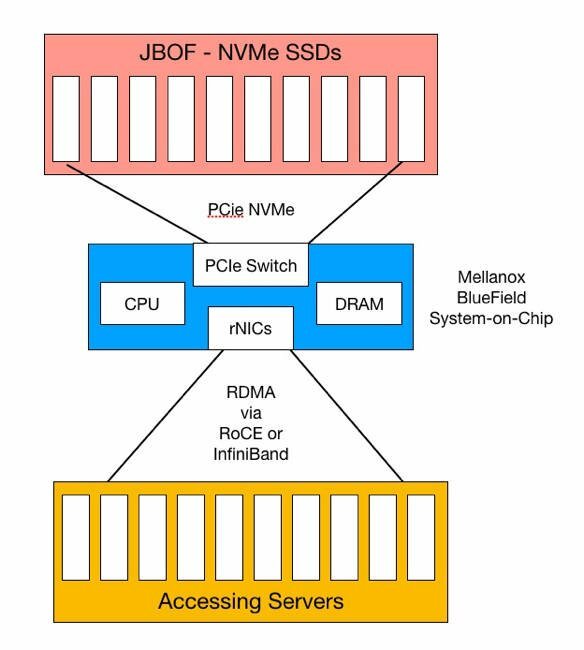 Mellanox created a BlueField Storage Reference Platform that can handle NVMe SSDs and serve them up across NVMe fabrics using its BlueField SoC as a development and reference platform. It's working with OEM and ODM partners to get BlueField in use.